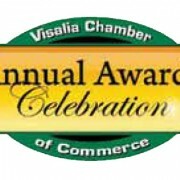 VISALIA - Make your nominations now for the Visalia Chamber of Commerce’s 61st Annual Awards Celebration. Each year the Visalia Chamber of Commerce honors those businesses and individuals who consistently go above and beyond to support the community. Nominations are now being accepted for the 2014 Man and Woman of the Year as well as, Non-profit, Small, Medium, Large, and Agri-Business of the Year. This year the Chamber is excited to announce a new category called Emerging Leaders. This category is a group award and will be given to those who support our community and are under the age of 40. The community is encouraged to nominate businesses or individuals who have exemplified outstanding service and commitment to Visalia. Call the Visalia Chamber of Commerce at (559) 734-5876 to submit your nomination by March 31, 2014. Winners will be announced at the 61st Annual Awards Celebration presented by the Visalia Chamber of Commerce on June 19, 2014 at the Visalia Convention Center. Small Business of the Year – Gerald Schneider D.D.S.